The Slavic group of languages - the fourth largest Indo-European sub-group - is one of the major language families of the modern world. With 297 million speakers, Slavic comprises 13 languages split into three groups: South Slavic, which includes Bosnian, Serbian and Croatian; East Slavic, which includes Russian and Ukrainian; and West Slavic, which includes Polish, Czech and Slovak. 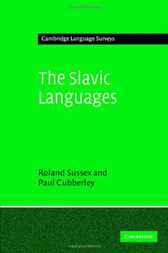 This 2006 book, written by two leading scholars in Slavic linguistics, presents a survey of all aspects of the linguistic structure of the Slavic languages, considering in particular those languages that enjoy official status. As well as covering the central issues of phonology, morphology, syntax, word-formation, lexicology and typology, the authors discuss Slavic dialects, sociolinguistic issues, and the socio-historical evolution of the Slavic languages. Accessibly written and comprehensive in its coverage, this book will be welcomed by scholars and students of Slavic languages, as well as linguists across the many branches of the discipline.